There are many different types of cooker you can have on a boat and your choice will probably be determined by the size of your boat, the type of cruising or sailing you do and, perhaps by the type of fuel you use on your boat in general. Gas cookers are often the preferred choice if you already use LPG gas for the likes of your water or heating, although you can still choose another type of cooker even if you use LPG for other purposes. The range of gas cookers is quite broad. Some are just a simple hob whilst others can have between 2 and 4 burners. You can get them with or without a grill or oven, although by having a grill and oven, it gives you a wider range of foods and preparation styles to choose from. They vary greatly in size too so your choice is going to have a lot to do with the size of your galley. Electric cookers with combination ovens have become more popular for those who prefer to stay moored in one place for lengthy periods of time as they’d be able to hook up to the local electricity supply provided but they’re obviously not as practical if you intend cruising around a lot. These tend to be safer than gas but are better suited to people who use their boat occasionally for recreational purposes as opposed to living on them permanently but they can be more difficult to light and then there’s the smell they give off which means that you need to keep windows open for ventilation purposes which might not be ideal in colder weather. These can be very practical as they use the same fuel as the boat but they tend to be rather expensive. They’re very sturdy and can withstand sailing within harsh environments such as the open seas and oceans but they are also quite large so they’re not very practical if you have a relatively small boat. Some people also opt for paraffin fuelled cookers as another alternative. Boats tend to rock and heal by their very nature and so will your cooker unless it’s secured. And, if you’ve got hot pans on it when it rocks, they can easily fall off the cooker and be quite dangerous. Therefore, if you’re cooking especially out on the open seas, your cooker should be mounted in gimbals so it will remain steady when the boat rocks or tilts. 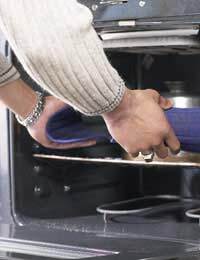 A fiddle rail and pan clamps are also a necessity to keep your pans on the cooker safe and secure. With a gas cooker, you also need to buy one which has flame failure device fitted so that if a gust of wind should blow out the flame, the gas valves automatically shut down to prevent the gas from escaping into the boat which is vital as LPG gas is highly explosive. Generally speaking, a good caravanning and camping store is usually the best place to check out potential cookers for your boat. By telling the staff the type of boat you have and how and where you intend using it, they’ll be able to offer you a choice from the most suitable cookers for your needs. Of course, a store specialising in marine equipment will be able to do this for you too, but you generally find that specialist marine equipment stores tend to be pricier than a caravanning store on a like for like basis.